For a tapered choral riser that can be immediately folded and stored, choose the Trans-Port Tapered Riser. This unique model can be folded up without detaching any parts. Tapered edges fit together perfectly for curved configuration. Your choir will look fabulous standing on Transport Folding Choral Risers from National Public Seating. 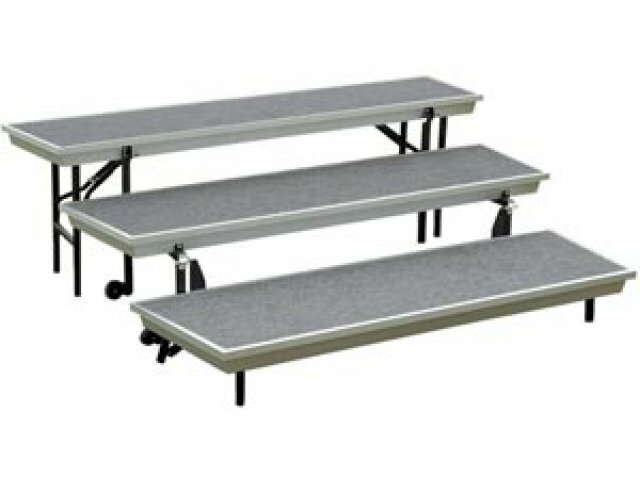 The portable multi-level choir risers will ensure that every student will stand out and be seen. 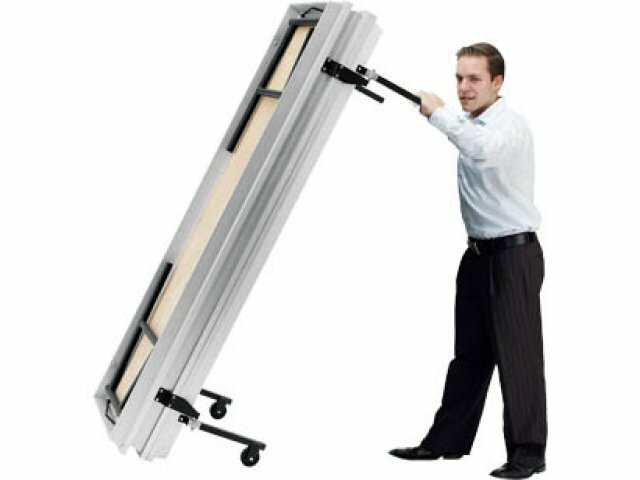 You won’t have to compromise on stability or mobility with Transport Folding Choral Risers. Locking mechanism on the legs ensures that they stay in place, while five-step folding action and sturdy side-handle make them easy to transport. Carpeted plywood platforms prevents slipping and reduces noise, while maintaining a professional look and feel. 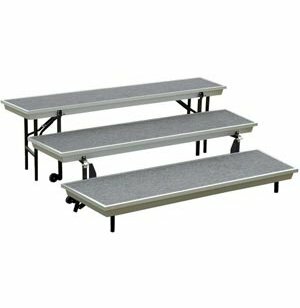 With a ganging device on the sides for easy attachment, these choir risers are perfect for a choir of any size. 266 Lbs. Per Square Ft.
Tapered Edges: This unit tapers from the top level riser 72 inches long to the bottom level riser 60 inches long. Multiple units can be attached to create a curved formation. Guard Rail Option: Optional guard rail available; see model TCR-RAIL. Easy Folding: Flips open or closed in five easy steps. Height of the unit when folded is 23". 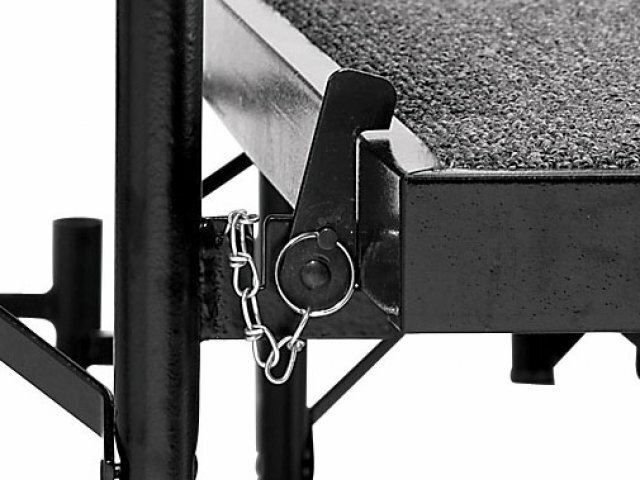 Sturdy Design: Locking mechanism on heavy-duty 14-gauge steel legs keeps these risers in place. Platforms are constructed from .75"-thick plywood. Super Strong: Platforms can support up to 266 pound per square-foot. Professional Look: Gray carpeted surfaces match gray frame. Multiple Levels: Tiered construction ensures that every member of your choir can be seen. Easy Attachment: Connecting devices on the side make these choral risers easy to attach to other units to accommodate a choir of any size. Transportable: These choral risers are easy to transport with wheels on the bottom of the middle platform, and sturdy side handles. Lightweight: Aluminum frames reduce weight without compromising strength. Note: These 18-inch, deep risers are not suitable for use with chairs. For seated choral risers see 36-inch deep risers. For band risers see all risers with 48-inch, deep levels. Tapered risers and straight risers cannot be connected to each other. Flips open in five easy steps!